In an effort to create jobs and begin to alleviate Illinois’ financial crisis, some lawmakers have proposed Illinois join a number of states across the country and allow fracking, also known as hydraulic gracturing, but many believe the idea is not fully thought out. Senator Mattie Hunter proposed SB 1418 in an effort to ban fracking for two years while a task force examines the possible environmental risks relating to fracking. Environmental groups across the state oppose the idea of fracking. The Illinois Coalition for a Moratorium on Fracking hosted an anti-fracking rally on Tuesday, March 12, in the Capitol where a number of Illinois residents voiced their concerns about the affects of fracking. State Senator Mattie Hunter had much to say in response to Gov. Pat Quinn's budget address on Wednesday. Recognizing Illinois’ critical financial situation and the need to prioritize, Hunter elaborated upon some of her priorities in respect to the state’s fiscal plan. Hunter took special interest in mental health, aging and human and health services funding in the governor’s budget plan. 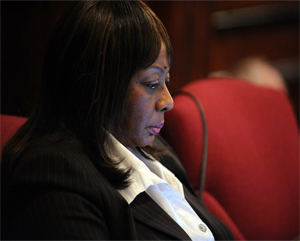 State Senator Mattie Hunter (D-Chicago) watched on as representatives from the Office of the Comptroller, the Governor’s Center for Tax and Budget Accountability and other state fiscal authorities and agencies presented on the state’s current financial situation and status regarding old bills. The individuals representing these offices and agencies were clear about the large issue of human and health care service bills that have still not been made good on. Throughout the committee, the speakers expounded upon old bills owed to the Medicaid system and state agencies such as the Department of Children and Family Services, the Department on Aging and the Department of Human Services. On Tuesday,March 13,the Illinois Capitol saw a variety of individuals representing different interest groups demonstrating their support for Senate Bill 1418, which provides for a hydraulic fracturing moratorium and the creation of a “fracking” task force. Activist and interest groups, in particular Illinois People’s Action and Southern Illinoisans Against Fracturing our Environment, lobbied in favor of Hunter’s hydraulic fracturing proposal. Additionally, a coalition of about a dozen other citizen and environmental groups lobbied on behalf of SB 1418 and in support of the House’s fracking regulation bill, HB 2615, sponsored by Rep. John Bradley (D-Marion). HB 2615 is currently being touted as one of the strongest hydraulic fracturing regulation proposals in the nation and legislation that could serve as a model for other states. However, there are still many questions that remain with respect to Bradley’s legislation.